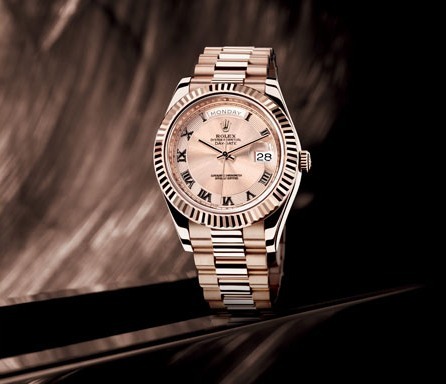 The Day-Date II is the quintessence of Rolex’s savoir-faire and is a watch for the man who appreciates classical elegance and the strength of innovation. stands out. Available in 18 ct yellow, white or Everose gold, and also in platinum, this horological masterpiece definitely stands out from the crowd. This majestic watch has a 41 mm case and a movement with a PARACHROM hairspring, highly resistant to shocks and magnetic fields. It is equipped with new PARAFLEX shock absorbers. Both features contribute to the watch’s chronometric precision and remarkable reliability. To further enhance the strong identity of the Day-Date II, a new range of dials has been introduced with a combination of contemporary and traditional designs. The Super-President bracelet with a Crownclasp adds the final touch and offers the level of comfort expected in such a watch. When it appeared in 1956, the Day-Date was a ground-breaking innovation, as it was the first watch to display the day of the week spelled out in full. It immediately met with great acclaim becoming recognised around the world as the watch of decision makers and influential personalities. The Day-Date II continues the Oyster Perpetual Day-Date’s very long heritage and exemplifies perfect mastery of the art of watchmaking. CASE: The Day-Date II case is crafted from a block of 18 ct yellow, white or Everose gold, or platinum. With a diameter of 41 mm, it is comfortable to wear and aesthetically pleasing. 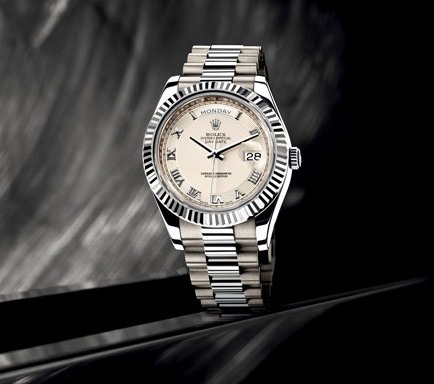 Fitted with a fluted or polished bezel, it is waterproof to a depth of 100 metres (330 feet). 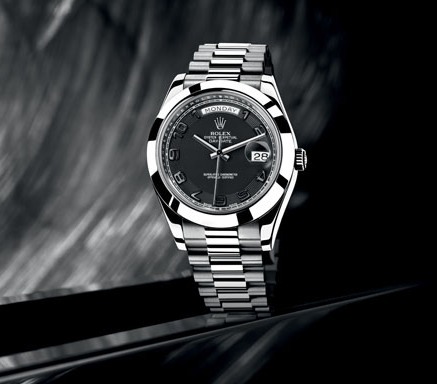 MOVEMENT: The Day-Date II is equipped with the calibre 3156, designed and manufactured entirely by Rolex. It is fitted with new PARAFLEX shock absorbers as well as a PARACHROM hairspring, extremely resistant to shocks and magnetic fields. Certified as a chronometer by the Swiss Official Chronometer Testing Institute (COSC), it has a power reserve of 48 hours. DIAL: The Day-Date II features new dials, available with either traditional or more contemporary designs. BRACELET: For optimal comfort, the Day-Date II is equipped with a new Super-President bracelet and a Crownclasp, the Rolex patented invisible clasp.